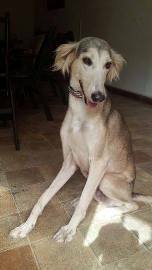 ASHA is Alabama SightHound Adoptions We are a not-for-profit group specializing in the rescue, rehabilitation, and placement of sighthounds, primarily Salukis and Saluki mixes, that we bring to the U.S. from Qatar. We work with dedicated volunteers throughout the world who help us free these dogs from lives where they are used for hunting and racing, then abandoned and left to die on the streets, or in the deserts, once their owners no longer have need for them. "The right patella is damaged but not causing any issues. The left hip however is severely damaged. There is deviation of the colon to the right (she's lucky she maintained function neurologically). There is also "ballistic" material throughout. Let me know if you have any questions. I talked with my ortho team today and they think $3 - 4,000 would be the ballpark (more than they thought yesterday after considering how involved it will be). They would reattach the triceps tendon to the bone, move the bone fragment down to where it's supposed to be, apply a tension band to keep it in to place as well as some suture, then place an external fixator to keep the piece in place but also maintain range of motion. They would also clean out any soft tissue that is restricting the joint, such as fibrous scar tissue. She would be in the fixator for 5-8 weeks then it would be removed. There would be additional rads to make sure everything is healed well as well as physical therapy throughout and after." Nathalia is relatively young, and though she experiences chronic pain, she has remained happy and loving, even after suffering this horrible abuse. We are dedicated to relieving her suffering and giving her true quality of life. This auction will be used to help us meet our goal of raising $4,000 for Nathalia's surgery and rehabilitation. She is currently receiving water therapy in order to build her body back up in preparation for her surgeries. Thank you for caring about Nathalia and for helping spread the word about our auction. 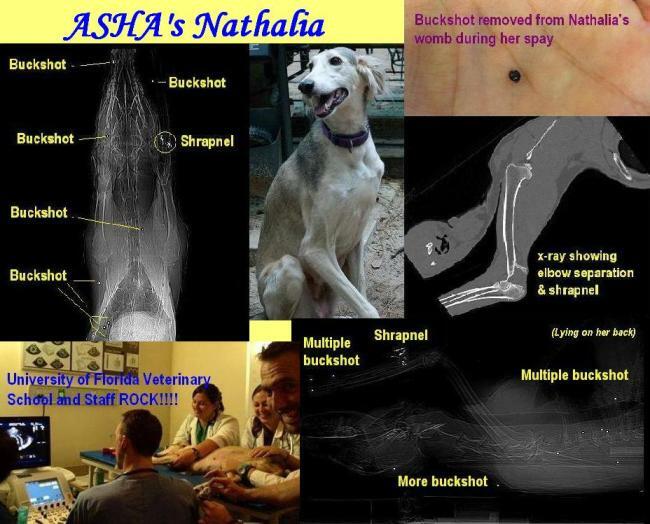 Donations to help Nathalia can be made directly to ASHA via our PayPal account. Simply designate your donation as being for Nathalia in the notes. ASHA PayPal: [email protected] Thank you so much! Winning bidders will be contacted at the end of the auction to make arrangements for payment and pickup/delivery/shipment of their items. Checks: winners will be directed where to send their checks, winning items will ONLY be sent once the check has cleared. Winning Bidders will receive their items by mail. Winners are responsible for postage, unless otherwise stated in the description with each item. Shipping may require an additional fee. Contact the Auction Administrator For Details prior to sending any payments.